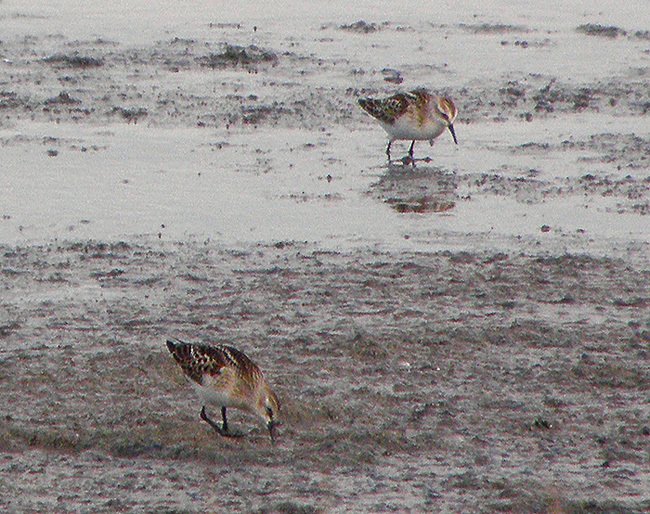 Little Stints are tiny waders mostly seen on passage, but small nubmers, such as this one, do Winter in the UK. They often mix in with Dunlin and can be tricky to pick out, despite the differences, just because picking out any different individuals from a swarm of little scuttling birds is a challenge. Their Autumn plumage is a lot more distinctive than their Winter one. Despite its tiny size, it migrates spectacular distances - from the Arctic to Africa and South Asia. - At Oare Marshes in September 2012, March 2012 and October 2017.